Blake and Donald with Captain Darryl, Mate Mikey and catch! Mahalo to Blake and Donald for choosing Maggie Joe Sport Fishing! The guys joined Captain Darryl and Mate Mikey aboard the Sea Hawk on a sport fishing charter. 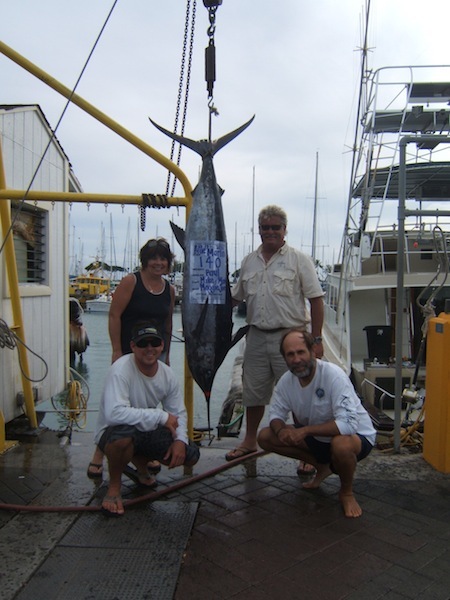 While deep sea fishing outside of Honolulu, Oahu they hauled in 160 lb Blue Marlin and 5 Mahi Mahi! Congratulations and Aloha! Angler Rollie and Logan with 85 lb Stripey and 150 lb Blue Marlin and Captain Mark and Mate Mikey! It was a great day aboard the Maggie Joe! Angler Rollie hauled in this 85 lb Striped Marlin and Angler Logan hauled in this 150 lb Blue Marlin while deep sea fishing outside of Honolulu, Oahu with Captain Mark and Mate Mikey aboard the Maggie Joe. 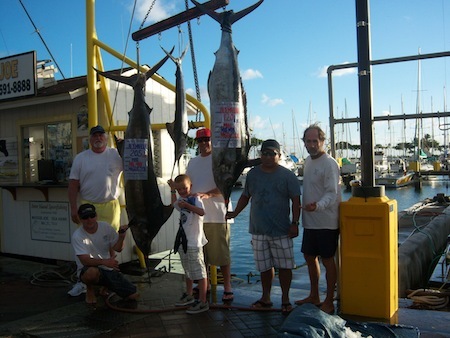 Mahalo for choosing Maggie Joe Sport Fishing and Aloha! Angler Darrell from Alaska with 150 lb Blue Marlin! Mahalo to Darrell for choosing Maggie Joe Sport Fishing! Darrell departed Kewalo Basin, next to Waikiki, aboard the Sea Hawk with Captain Darryl on a full day sport fishing charter. 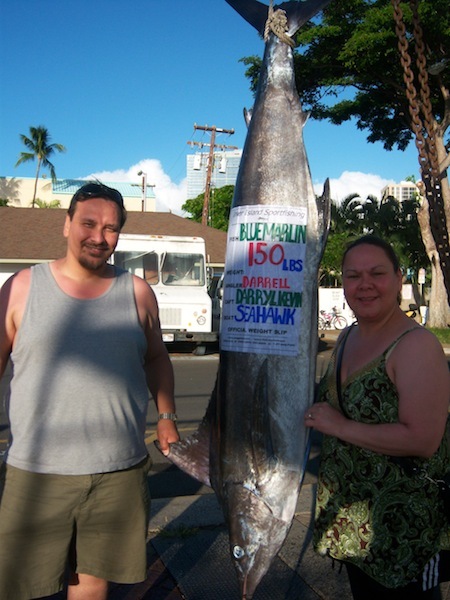 While deep sea fishing outside of Honolulu, Oahu Darrell hooked up with and hauled in this nice 150 lb Blue Marlin! Aloha! 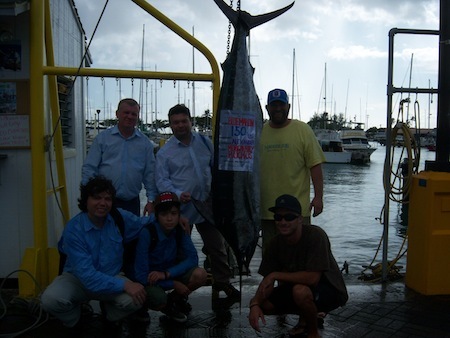 Angler Alexander with his crew, Captain Morgan, Mate Billy and 160 lb Blue Marlin! 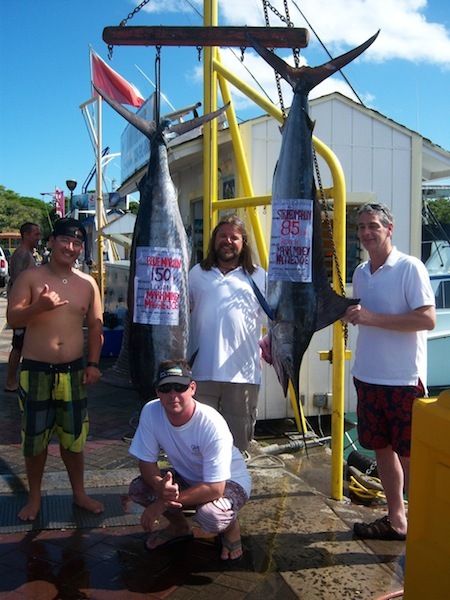 Mahalo to angler Alexander and his buddies for choosing Maggie Joe Sport Fishing! The group joined Captain Morgan and Mate Billy aboard the Sea Hawk on a sport fishing charter today. 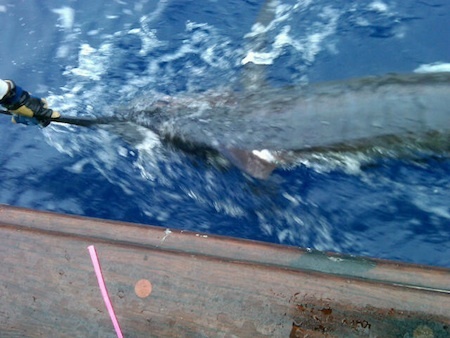 While deep sea fishing outside of Honolulu, Oahu they hooked up with this 160 lb Blue Marlin. Alexander hopped in the chair and hauled it in! Aloha! Decky Johnny and his hat-cam put together this great deep sea fishing video from the Maggie Joe. The video features Marlin and Mahi Mahi sport fishing charters outside of Honolulu, Oahu. Aloha and we can’t wait to see you out on the water! 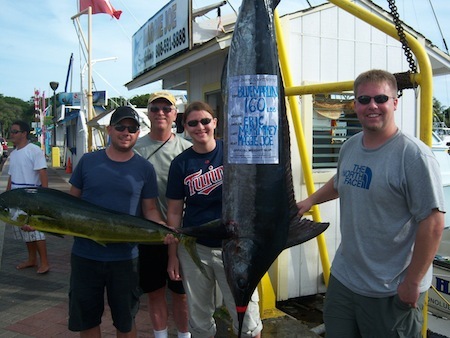 Eric, Ron and Ronald with 160 lb Blue Marlin and a Mahi Mahi! 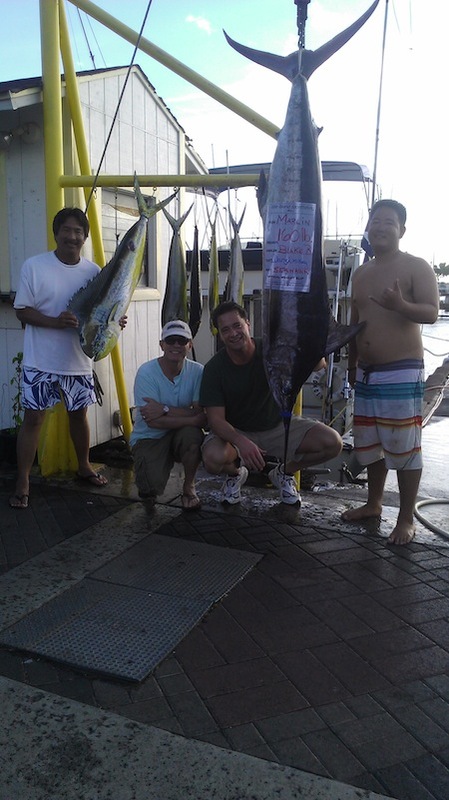 Mahalo to Eric, Ron and Ronald for choosing Maggie Joe Sport Fishing! 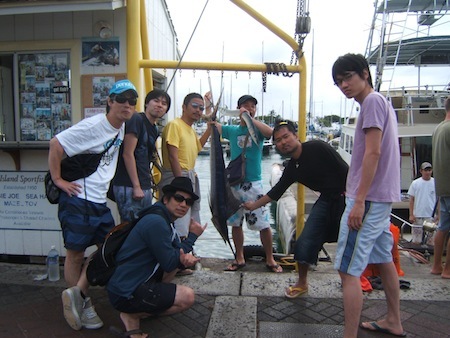 The group departed Kewalo Basin, next to Waikiki, aboard the Maggie Joe with Captain Mike on a sport fishing charter. While deep sea fishing outside Honolulu, Oahu they hauled in this nice 160 lb Blue Marlin and a Mahi Mahi! Congratulations and aloha!